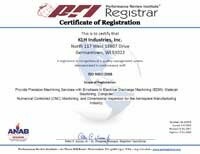 Quality Certifications | Precision Machining Company | KLH Industries Inc.
KLH received ISO 9001 certification in March 2000. The AS9100 quality system is established by the Society of Automotive Engineers (SAE) International to address additional needs of quality and safety in the aerospace industry. AS9100 fully incorporates the current version of ISO 9001. KLH provides all of the documentation necessary to satisfy the largest aerospace and aircraft manufacturers: first article inspection reports, material certifications, certificates of conformance, and more. KLH received AS9100 certification in August 2010, and has been successfully machining life and flight critical parts ever since. The National Aerospace and Defense Contractors Accreditation Program (Nadcap) is a standards-setting program for the aerospace and military industries. Unlike ISO and AS9100, Nadcap coordinates the standardization of specific processes, rather then procedural processes. KLH is Nadcap certified in non-conventional machining: EDM, including wire EDM and fast hole (i.e. small hole EDM drilling). These standards specifically control the inputs and potential variables of the EDM process, and are designed partly to control the heat-affected zone during the EDM process. Nadcap accreditation for non-conventional machining requires a valid quality system, certified to AS9100 or equivalent. The International Traffic in Arms Regulations (ITAR) are a set of government regulations controlling the transfer of articles, services, and information on the United States Munitions List. Established in 1976, during the Cold War, it controls the export of both physical goods (parts, assemblies) and intellectual property (e-mails, drawings, databases). Entrance to KLH’s facilities is restricted at all times; guided tours are available. Any electronic dissemination of information is securely controlled. KLH highly recommends that visitors to the website do not send ITAR-controlled information via the online RFQ form. This is not specific to KLH Industries.com, it is a rule of thumb for ITAR and export control. KLH will apply ITAR procedures and policies if the customer directly states, if mandated by flow down requirements, or if the make or fit of a part suggests a defense-related technology. ITAR is a matter of national security. ITAR is a registration, not a certification, as the federal government does not certify or regularly audit companies. Although not technically a formal quality system, ITAR has been a part of KLH’s operations since May 2008.